My husband and I are both travel nurses and we started our journey in San Francisco. We got a taste for the real estate there when we found a studio apartment in the city for…wait for it…$2,600 a month. Yup, all 400 square feet of it. It was furnished, allowed dogs, and was leased to us for 3 months. After a few weeks into our assignment, we became inspired to buy a Volkswagen Westfalia Vanagon, one of those nostalgic buses that look super cute on Instagram (#vanlife.) We bought a big orange one and used it as a means to see the country. We’ve used it to take multi-week road trips, as a temporary apartment when on assignment, and as a daily commuter. This little van gave us a taste of setting up a portable living situation when going travel nursing and while living in this 60 square foot space was definitely challenging, there are many travel nurses that are doing it right! 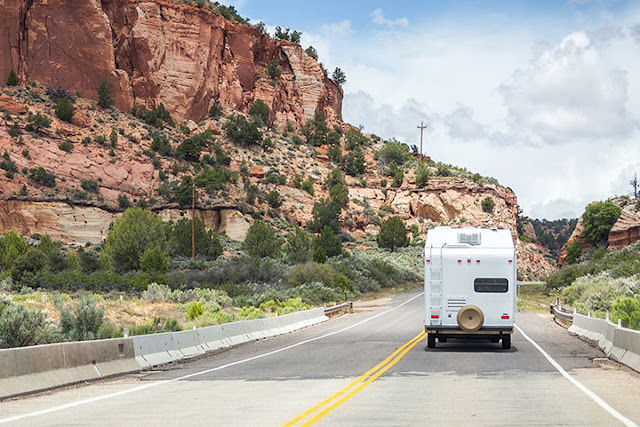 If you are considering taking your RV, camper, or any other home on wheels to your next travel assignment, add the following pros and cons to your research! Cost of renting an apartment can be steeply more expensive especially when renting apartments in highly populated areas. From deposits to pet fees to up-charges for short-term rentals, these costs all add up and don’t “go anywhere” in comparison to spending the same money investing in an RV or RV-like home. If you’re able to get your hands on a deal for a mobile living space - your savings have begun. Oh and that housing stipend? Straight to the bank, baby. The space is always yours. No matter what happens, you always have a furnished space that feels like home. You know exactly where everything is. You know the intricacies and the idiosyncrasies of your space. And for all my healthcare germaphobes out there – you at least know that it’s only your cooties you’re dealing with, and not any previous unknowns. We have always traveled with our two dogs, and from experience, transitions are the hardest on them. The quicker we get into a routine, the better for their digestive systems – and our sanity. When we’ve moved around in our VW van, however, our home stays familiar to them and they go through a more minimal period of acclimation. The tricky part is keeping the space cool, especially during times when we leave for the day or night. You get to change your mind as easy as one, two, free. Greater connection with the outdoors. This comes naturally when living in a mobile space. It’s easy to get good sunlight and campsites typically have picnic tables and other outdoor amenities that draw people to enjoy the outer space. In contrast, it’s easy to get cooped up in an apartment, and there are way too many first-floor units out there that don’t get enough sunlight…even in the sunniest of cities. You don’t get to move into a space that’s unique to that city. Sometimes, I want to get a feel for the city, which to me means living in a space unique to that area, carving my place in the local community of permanent residents and transients alike. It makes me feel like I am truly “living” in the city, not just passing by. You carry everything with you, like a turtle and its shell. There’s something kind of freeing about only packing your clothes, laptop, and yoga mat when you move somewhere for three months. Walking into furnished apartments and setting up life doesn’t take but maybe half a day, and when the assignment is all done, packing up and peacing-out is a breeze. Maybe you even board a plane and hit up your next destination without a second thought. You could have one of those sweet RVs that have a shower and toilet (and maybe even a tub). Or the camping site may have community showers and bathrooms. But if you’ve parked your VW Westy in the hospital parking lot like we did for a bit, you better get creative about how to stay hygienic and how to manage your waste. We have spent many weeks showering after work in the cath lab employee bathrooms, using a bucket and kitty litter when the going was inevitable, and stocking up on enough scrubs to make it through a couple weeks without needing to visit a laundry mat. Ideal? Not really. Adventurous? Arguable. Any breakdowns and it’s your issue. This is true of any renter vs owner situation. If you’re renting and the pipes freeze, your landlord better be high-tailing it over. But if you didn’t take proper precautions of your camper and find out the hard way about cold weather, now you’re shouldering that cost and labor, and it may not be pretty. Not to mention breakdowns that could happen in-transit; if you’re on deadline to make it to your first day, you may find yourself ditching your kombi - with half of your things in it - at a storage facility en route to your next assignment, coming back to save it later (been there, done that). What do you do with this home on wheels when you’re done with it? If you’ve got a place to park it in between assignments, you’re set. But sometimes parents’ homes are already overcrowded with cars and a 5th wheel doesn’t do much to help. Also, if you take an extended break from using it, you must stay mindful of sun-damage, mold, and other unfortunate things that could happen when a space goes unoccupied for long. When you decide to go travel nursing, you must ultimately do what makes you happiest; this will get you through the toughest time of either option - and there will be tough times. Whether it’s fixing the AC on your home at a truck stop in 100-degree weather, or when you’re on your hands and knees scrubbing your apartment floor (after spending all day moving out) in order to avoid the $300 fee your complex will charge you if you’re unit is not “move-in ready.” Make the decision that best speaks to your soul (and your wallet) and those rough times will all be worth it!